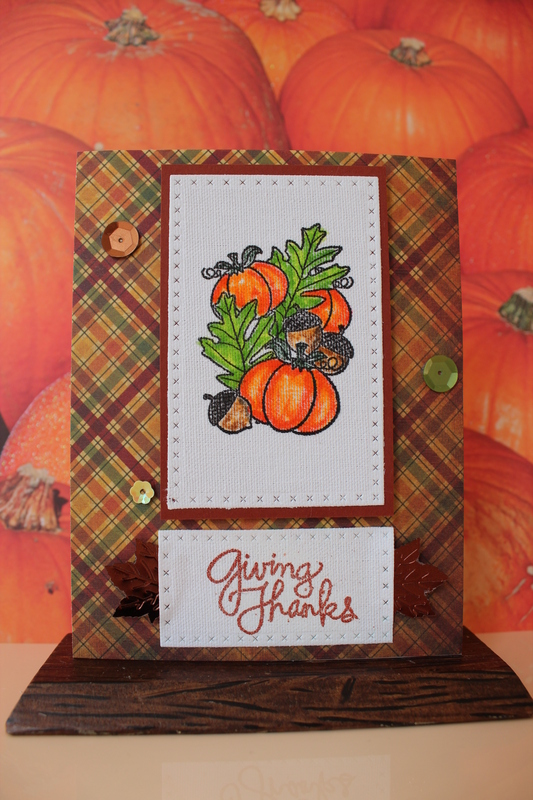 This might be my last card for the fall bloghop. I do have another stamp set, that I don’t think I have ever used for these bloghops but time is running out. This card came out of no where. 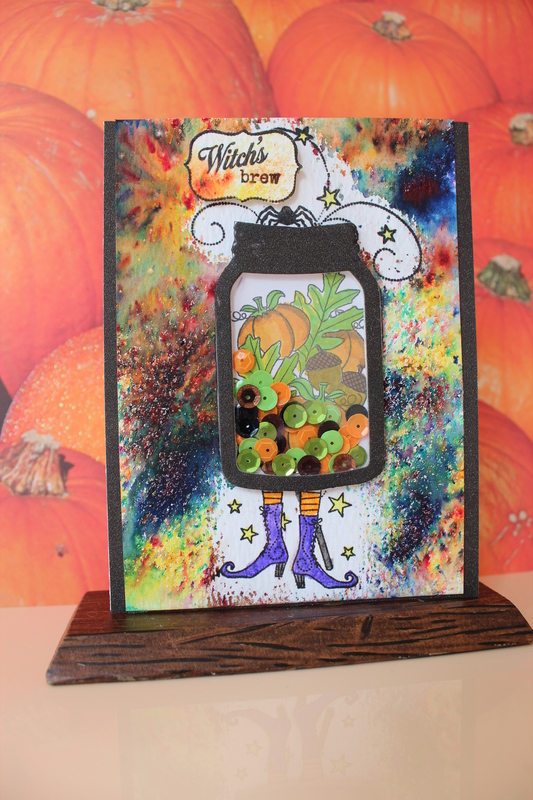 I wanted to make a card with a coffee bean background that I had made with distress crayons, but by the time I picked out the stamp and sentiment, my mind went in a totally different direction. It was going to be a bit of a throw in card without much thought, but surprisingly, I ended up liking it a lot. I think it is because I really wanted to use the sentiment and it went well with the other elements I chose. Skipping Stones Designs Funny Coffee Vol #1, Wplus9 A Pocketful stamp set, SEI canvas blue jean paper, Simon Says Stamp cardstock, Peerless watercolors,Simon Says Stamp card base, real coffee beans and Scor tape. I usually have a new (to me) coffee stamp to use for each of these bloghops and this Fall bloghop is no exception. I know this stamp is new only to me, as it is in fact, a recently retired one from Taylored Expressions. This stamp set spoke to me as it reminded me of my coffee meet ups at Extreme Bean with my friend MJ, who has now moved to greener pastures (literally, the greener and lusher Vancouver Island). Taylored Expressions Perfect Blend stamp set, Reverse Confetti All Framed Up die, Memory Box Coffee Bean Collection die ( made a mental note that the littler beans in this set could double as mouse turds should I ever have such a need for a different card LOL), Color Burst watercolor powder, Judikins Microglaze, Tim Holtz Distress Markers, Simon Says Stamp card base, and Scor tape. The challenge this week was to use pumpkins in three different ways. This is one of my favourite types of challenges, so I dropped what I was doing (housework………so it was an easy choice) and started to get to fun. 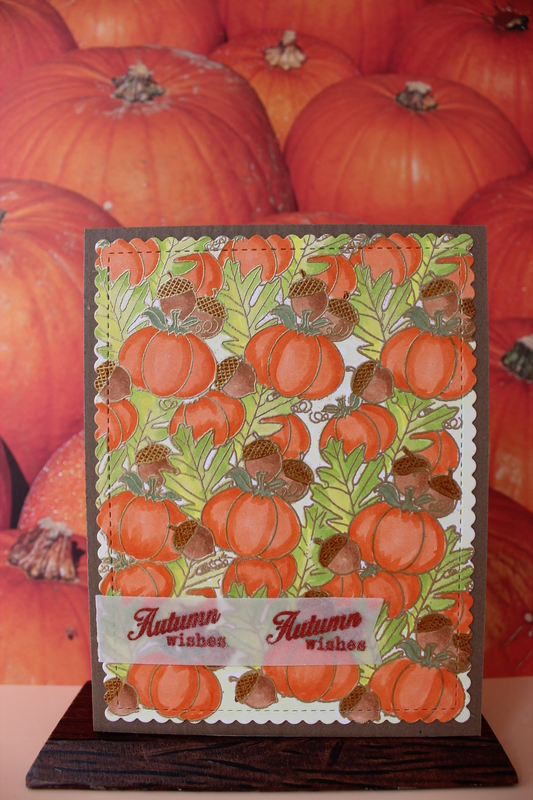 I decided not only to use pumpkings in three different ways but to use the very same pumpkin stamp in three very different ways, Additionally, I decided to make the three cards in three different styles with three different techniques. Amazingly, they all came together and I like them all! Oh happy day! 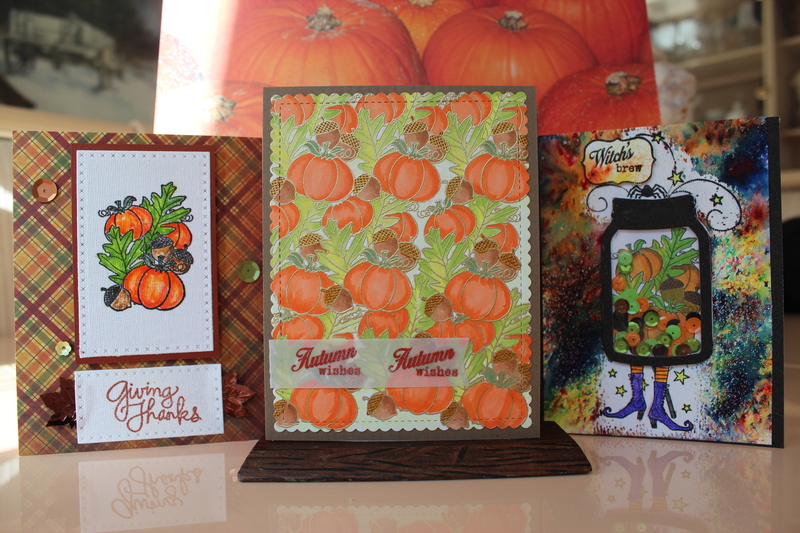 Card #1: Uses Papertrey Ink Friendship Jar Fall Fillers stamp set, Recollections gold embossing powder, Inkadinkadoo masking paper, Copic markers, My Favorite Things Blueprints 27 die, Recollections card stock, Simon Says Stamp card base, Elen Hutson 40lb Vellum and Scor Tape. Card #3 : Uses Papertrey Ink Friendship Jar Fall Fillers stamp set, Friendship Jar shaker die, Unknown glitter paper, Color Burst watercolor powders, Judikins Microglaze, Wink of Stella, Lawn Fawn and Craft Medley sequins, Tim Holtz watercolor paper, Simon Says Stamp card base and Scor tape. And finally, here they are in one picture. Back in July, Pink Cloud Racing Stable (brother Perry and sister in law Annette) hosted a remarkable event in Saskatoon. My other brother Barry and sister in law Gwen helped out as did my cousin Brian to make sure the event went smoothly. My sister in law from the other side of my family (Darlene) was the big winner of the night. Another sister in law Donna from the other side of my family also came out for the event, which made it truly special. I wanted to preserve the memory and so I created this double page layout.